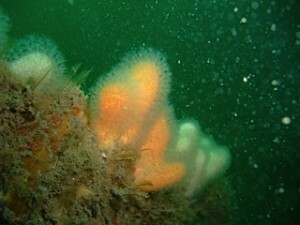 First dive of the year at Bawden Rock at the weekend showed that the site has withstood the winter storms well with all sorts of vibrant marine life. Hydroids and bryozoans were in great shape before their various predators have got to work on them and the other plankton feeders like jewell anemones and deadmens fingers were stunning. Visibility had finally started to improve this weekend with about 8-10m offshore. 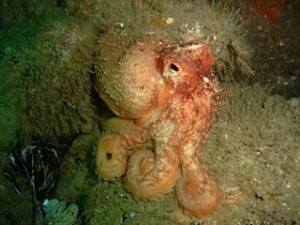 We even managed to find an octopus, a species we had never found at Bawden Rocks before. It was beautifully camouflaged and only found because a crab was walking right over the top of it. We had some great views of it before it squirted away in a cloud of black ink. The seabirds are back on the cliffs with early indications that numbers of shags, razorbills and guillemots may be down a little after the winter wrecks of birds but we will have to wait for a month or so to be sure. Clifftop flowers are starting to look great. Well worth a trip from Chapel Porth to St.Agnes Head passing by Tubbys Head.